After going through the overview of tools & technologies needed to become a Data scientist in my previous blog post, in this post, we shall understand how to tackle a data analysis problem. Any data analysis project starts with identifying a business problem where historical data exists. A business problem can be anything which can include prediction problems, analyzing customer behavior, identifying new patterns from past events, building recommendation engines etc. This is the first step of analysis. Business identifies a problem and a problem statement with desired outcome is defined. In this stage, a Data Scientist should understand the problem statement, the domain knowledge of the problem. After thorough understanding of the problem statement, a Hypothesis will be proposed. As a second step, all the data sources related to the problem statement will be identified and pulled into a central repository. The data sources can vary from SQL databases to text files to csv files to online data. If the data size is large we may use Hadoop to pull, store & pre-process the data. 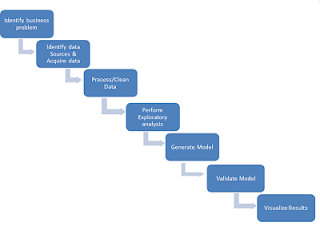 Data Clean step is considered to be one of the very important phases in Data analysis. The accuracy of the analysis depends on the quality of data. Formatting the data as per the data analytical tools we use. Data Transformations like normalizing the data Identifying outliers & handling etc. This step involves extracting features from the data and feeding them into the machine learning algorithms to build a model. Model is the solution proposed for the problem statement. 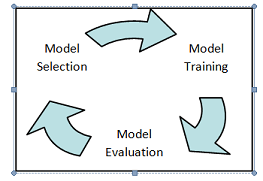 This step involves: Model selection, model training and model evaluation. Model selection: Based on the type of business problem we are dealing, a model will be built. For example,if the objective of the analysis is to predict a future event, we need to build a Regression model for prediction. Model Training: After selecting the Model for the analysis, the entire dataset is divided into 2 parts – Training data & Test Data. 3/4th of the entire data will be fed as input to the Model Algorithms. Model Evaluation: Once the model is built. The next step is to test the model & validate it. The data used for testing the model is the remaining 1/3rd of the dataset in the previous step. 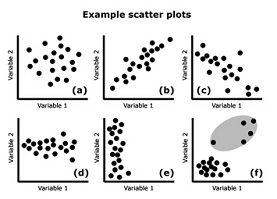 This is the final step of Data analysis where the results of the model & problem solved will be presented generally in visual plots/graphs. Few visualizing tools: d3.js, ggplot2, tableau.